Apple may have only opened 26 stores throughout the 2009 fiscal year (which ended in September), but get ready, because they’re about to unleash between 40 to 50 more stores by the end of 2010. Just this week, Apple will have opened three brand new stores around the world: one in Paris—at the Louvre no less, one in Upper West Side in New York City, and Australia’s sixth store in Westfield Chermside mall in Brisbane. 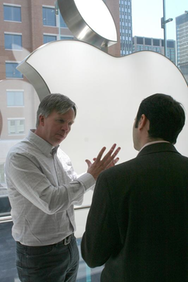 During the unveiling of the Upper West Side Apple Store, Apple’s Senior VP of Retail Ron Johnson (pictured) said that Apple is aiming for even larger stores in the future. As if Apple Stores aren’t big enough already, according to Johnson, “Our stores are too small. Our biggest challenge at the Genius Bar—we cannot build them big enough.” Apple Store sizes range between 540 square feet and 28,000 square feet but future stores will be designed to fit at least three display tables side by side. Even the standard stores will be larger. The UWS Apple Store is home to a 45-foot Genius Bar, similar to the one in the George Street store in Sydney, Australia, and one foot shorter than the Regent Street Store’s. Perhaps one day we’ll see an entire Apple Store made up of only Genius Bars. The majority of the new stores will be what Apple calls “significant stores.” Johnson said, “Other retailers call them flagship stores. We don’t use that word.” Some of the cities that will host these new iconic stores include Paris, London, and Shanghai, with Apple on track to open them before the second half of 2010. Other countries due to get more stores include Canada, Australia, Italy, Switzerland and Germany. Tim Cook acknowledged during last quarter’s financial call that international sales are stronger than US sales with up to 40 percent year-on-year rise in Europe and 42 percent in Asia Pacific. These new stores would mark Apple’s increasing presence in those regions. In 2001 when Apple began rolling out retail stores, the company’s entire revenue was $5.4 billion. In 2009, Apple Stores alone raked in $6.6 billion in revenue and since 2001 they’ve had 170 million retail customers and 10 million Genius Bar visitors. On average, each store made $26 million this year, which is similar to other big brand stores, butthat comes to around $4,300 per square foot, five times more than Best Buy.